When it comes to living greener, our primary resource is knowledge. The purpose of this book is to boil down the information that is out there into one complete package of environmentally sensitive products, services and programs available to Calgarians. Live Green, Calgary! gives you precise, applicable information that will save you time. And there are money-saving tips, too! Live Green, Calgary! puts local green programs, products and services at your fingertips so you can live a more environmentally friendly lifestyle. As always, greener choices help ensure that we will have an abundance of clean and healthy resources for a long time to come. Live Green, Calgary! 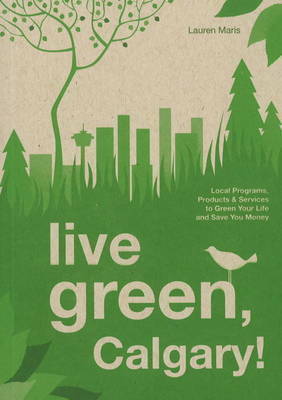 highlights the free services, programs and rebates available so Calgarians can save money while getting greener. Live Green, Calgary! saves you time by giving you the information you need to green your life in Calgary, all in one place and relevant to your family. Lauren Maris has done the legwork for you ...all you need to do is start exercising your options! Lauren Maris lives in Calgary, Alberta, and is the owner of EarthWise Solutions. She makes it easy for Calgarians to get on the green team by creating customised home-efficiency plans to help them consume less energy and produce less waste in their homes.